Easter Egg Shop is an awesome management challenge game. 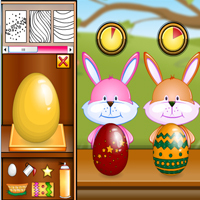 Use your skills to serve up the Easter eggs to the bunnies. Color up the Easter eggs and apply the required design and serve it. Fulfill the target and go through all the levels. Have a happy Easter and be sure to wait for the Easter Bunny to bring you treats from his special Easter. Good Luck Have Fun!